A Bakersfield, CA student has made her way to the final competition for National History Day with a performance called Genocide Denied; The Violent Encounter of 1915. 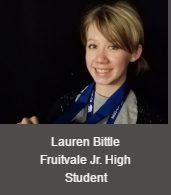 Having won the county-level and state competitions, Fruitvale Jr. High student Lauren Bittle is now raising funds through a GoFundMe.com campaign to help attend the national contest a the University of Maryland, June 12-16. Bittle has participated in National History Day for several years. This year she spent many hours studying the Armenian Genocide, conducting interviews, and preparing her presentation. She recently won the Junior Performance championship for California, competing against 18 other junior high school students. Lauren Bittle performs her 2016 National History Day piece, Genocide Denied; The Violent Encounter of 1915. National History Day is a non-profit education organization inspiring students to compete in local, regional, and national contest for the best researched and presented project.